Typically, this blog focuses on deals, discounts, & fun things to do in Boston. But there are also times when we should NOT be wicked cheap. With what’s happening in Flint, Michigan, this is one of those times. I am sure by now you have heard about the Flint water crisis. I’ve been contacted by a representative from ZeroWater to promote their program that could help Flint with their situation, and while it’s different than my typical type of post, I feel it is worth promoting so here it is. ZeroWater, a water filtration system based in Pennsylvania, is continuing efforts to provide clean water for the community of Flint, Michigan with the announcement of “Filters for Flint,” a ONE for ONE matching program in conjunction with United Way. ZeroWater Pitchers are NSF certified for the reduction of lead – which is what Flint needs to help get CLEAN WATER NOW and on an everyday basis. ZeroWater is committed to support the ongoing efforts as much as they can, as the community needs GOOD water NOW. Contaminants in the water is an ongoing crisis not only for Flint – everyone needs to be aware of what is in their water. 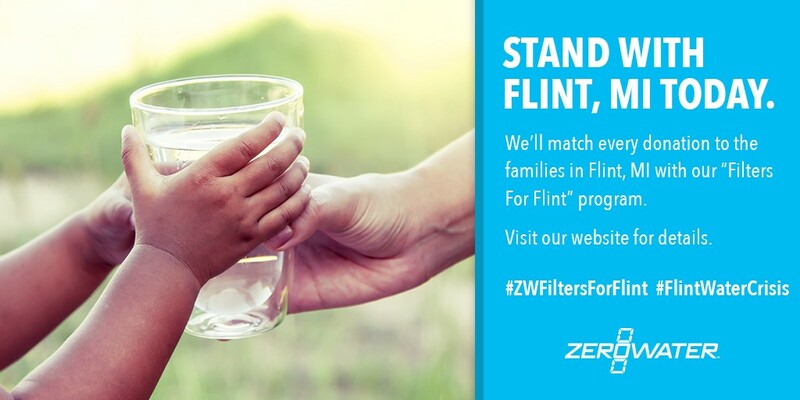 January 2016 – Bensalem, PA – ZeroWater is continuing efforts to provide clean water relief to the community of Flint, Michigan with the announcement of “Filters for Flint”, a one for one matching program in conjunction with United Way. Both ZeroWater and United Way understand that this is an ongoing problem and the demand for continuous disbursement of certified filters for lead reduction is crucial during this time. 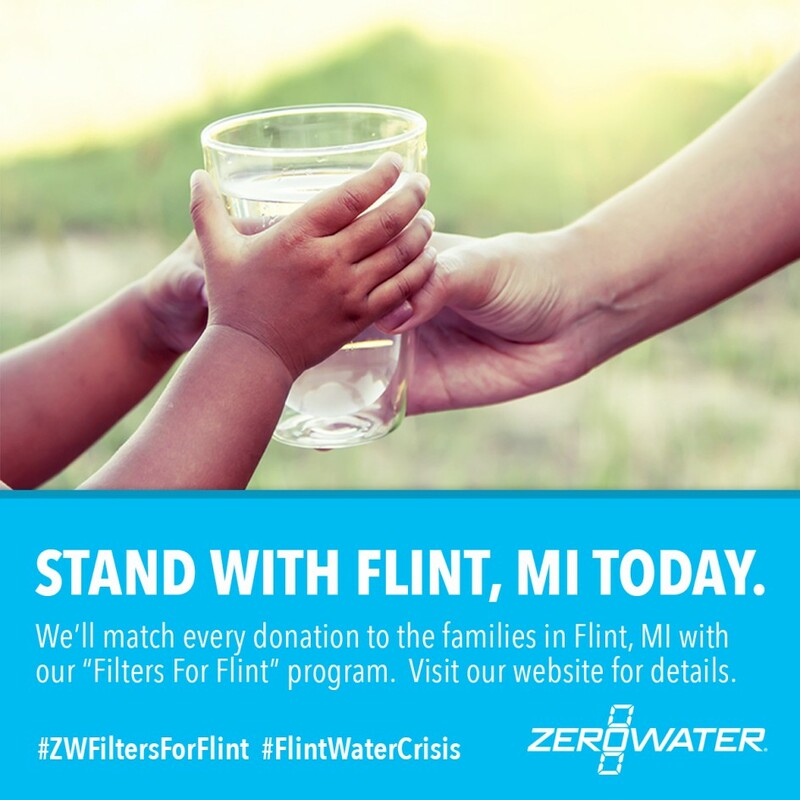 ZeroWater will match all product contributions (One for One) ordered on behalf of Flint, and are encouraging donations from individuals as well as organizations and corporations committed to helping a community in need. All products will be shipped by ZeroWater to United Way of Genesee County, who will in turn distribute them through officially established outlets to the community. “This lead issue could go on for some time” says Jamie Gaskin of The United Way of Genesee County. “We are thankful for all the help that ZeroWater has and can provide. It truly makes a difference in working through this awful crisis”. Being the only pour-through filtration pitcher that is certified by NSF for lead reduction, the company is committed to the immediate and ongoing support of the Flint community. Since the Flint lead concern became public, ZeroWater has been helping to distribute filters into the community, particularly the children who are most susceptible to high lead levels, through the United Way and key retailers. Please stay connected with our website and social media outlets for announcements. For more information or to setup an interview with ZeroWater executives, please contact Dawn Ryden at 512-294-6218 or Dawn@3DMKG.com. ZeroWater delivers high performance water filtration to consumers through its patented 5-stage ion exchange filter, which removes virtually all total dissolved solids (TDS). By removing virtually all TDS, ZeroWater is the only gravity-fed filtration system to match the TDS levels found in Purified Bottled Water. ZeroWater is one of the only pour through filtration systems on the market that is NSF certified to meet standards for lead removal as well as other heavy metals. In addition, Good Housekeeping Research Institute findings reveal that ZeroWater filters remove more pharmaceuticals and chemicals than Brita and PUR. ZeroWater is the only water filtration system to receive NSF endorsement for its reduction capabilities in chromium-3, chromium-6 and lead. ZeroWater’s products range from a 6 Cup to a 23 Cup pitcher and dispensers, all employed with the patented 5-stage filtration technology that removes 99.6% of TDS (Total Dissolved Solids) offering superior filtered water. I found your site because I’m planning a trip to Boston this summer with some friends from college. I was pleasantly surprised to see this post. I grew up in Flint – my whole family still lives there. I left for college in 2011 and decided to stay out of state after graduation last May. This has been going on for so long and the people of Flint have felt powerless to stop it. It’s been heartbreaking to see my friends, family and neighbors go through this from afar. It’s so encouraging to see people from all over the country – all over the world! – stand up for and help out Flint. It’s a city that’s endured unimaginable hardship over the last 50 years, but it’s spirit remains strong. Thank you for doing your part to help the city I love!